Dutch soccer great Johan Cruyff, who revolutionized the game as the personification of "Total Football," has died. He was 68. Family spokeswoman Carole Thate confirmed to The Associated Press that Cruyff had died. Joaquin Munoz of the Cruyff Foundation in Barcelona said he died in the Spanish city as a result of lung cancer. Former France international Michel Platini said football had lost one of its best ever players. "Johan was my childhood hero, my idol and my friend," said Platini, the former head of European soccer. "I will miss him dearly. My thoughts are with his family, and I send them my love." Cruyff won European Cups three times with Ajax as a player and once with Barcelona as a coach. He was European player of the year three times and, in 1999, was named Europe's best player of the 20th century. Though a World Cup title eluded him, he was the pivotal figure on the Netherlands' 1974 national team that electrified the sport with its "Total Football" tactics, with players constantly interchanging roles. The tactics influenced the game worldwide, bringing fresh life to a sport that had become stuck in a defensive mindset. Cruyff smoked cigarettes most of his life and finally quit after undergoing an emergency heart bypass operation in 1991. After more heart trouble in 1997, he vowed never to coach again, though he remained a vocal football critic and analyst. His commentary became oft-quoted classics: "Every disadvantage has its advantage," ''You can't win without the ball." With Cruyff on the field, Ajax won the European Cup for three consecutive years from 1971-1973 before he moved to FC Barcelona midseason in 1973 and led the middle-of-the-table team to its first national title in a decade. The transfer fee paid by Barcelona was a world record and is seen as a milestone in the commercialization of sport. He was also one of the first soccer players to take on corporate sponsorships. Even if it is common now for major players to enjoy a golden twilight in the United States, Cruyff did so almost 40 years ago, when at 32, he joined the the Los Angeles Aztecs. 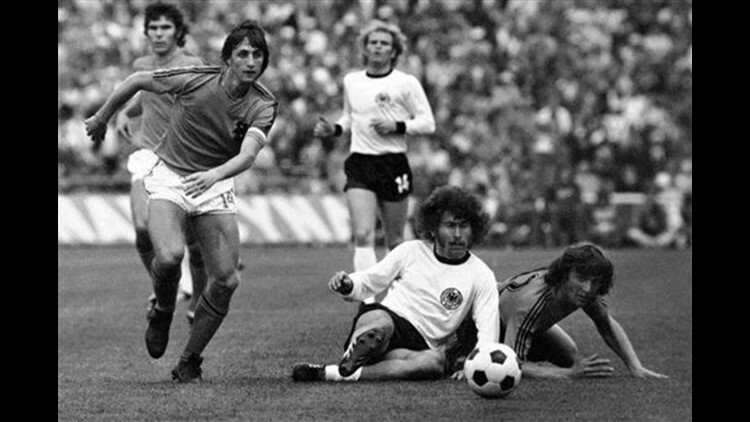 Cruyff's pronouncements on the game skirted the line between profundity and nonsense. Cruyff launched a tradition of great forwards coming out of the Netherlands that included Marco Van Basten, Patrick Kluivert, Ruud van Nistelrooy and Dennis Bergkamp.